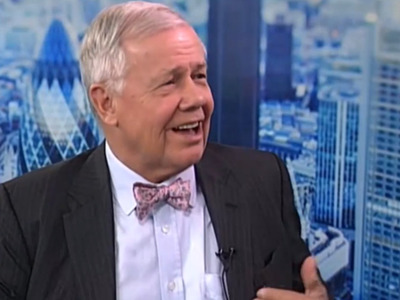 Now that the Russian economy is tanking, Jim Rogers is diving in. “I’m bullish on Russia,” he told Bloomberg’s Mark Barton on Tuesday. After being bearish on Russia for 46 years, Rogers now believes that the country’s economy and markets have changed for the better. “…Things are changing in the Kremlin, in my view. And so, therefore, I started investing,” he said. “The attitude [in Russia] used to be: just take the money away from them, shoot them, put them in jail, whatever it is. Bankrupt them if we don’t like you. But that’s changed. Somebody there realises [that] you cannot treat foreigners, or foreign investors, or capital that way,” Rogers said. Recently, the Russian economy has taken a serious beating. For starters, the ruble is now in free fall and near record lows, and inflation is way above target. Additionally, falling oil prices have put immense pressure on the economy. And while most are worried about what’s going on with Russia’s economy, Rogers seems optimistic. “One reason I got involved with Russia… was because they had huge foreign currency reserves. And they don’t have much debt. They have a convertible currency… I mean, Russia’s astonishing once I got more and more looking into it,” he said. “Russia’s hated. In my view, wrongly so. And I hope this is all going to pass, and I’ll make a lot of money,” Rogers said.